The periodical calibration of the process control instruments and the standards guarantees the reliability of measurements and therefore the quality of the finished products. Guarantees the traceability of measurements. Reduces variations of the technical specifications of products. Prevents defects and makes measurements compatible. 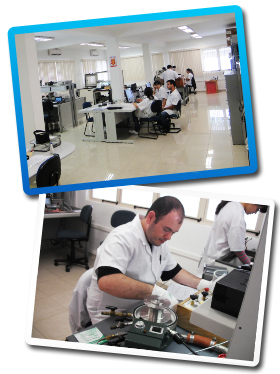 (under the number CAL 193 - ISO/IEC 17025:2005) and belongs to the BRAZILIAN CALIBRATION NETWORK (RBC), follows the Quality Management System in accordance with ISO9001:2015.
gage, absolute pressure, and vacuum with uncertainties up to 80 ppm (digital manometer), 100 ppm (analog manometer) and 150 ppm (pressure transmitter). for RTD/temperature meter with RTD sensor with uncertainties up to 0.01 °C. for Thermocouple/temperature meter with Thermocouple sensor with uncertainties up to 0.04 °C. for RTD meter/simulator with uncertainties up to 0.03 °C. for Thermocouple meter/simulator with uncertainties up to 0.02 °C. for liquid baths with uncertainties up to 0.04 °C. for dry block calibrators with uncertainties up to 0.20 °C. with uncertainties up to 0.8 µV. with uncertainties up to 8 nA. with uncertainties up to 0.18 mΩ. See at INMETRO website the detailed description of the ranges of pressure, temperature and electrical signals.